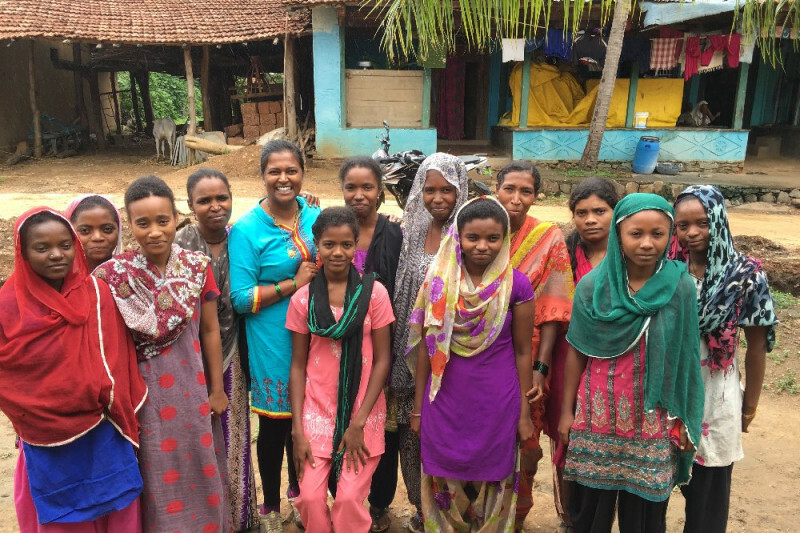 This will be my fourth year working on the Empower Women-Sanitary Solutions project in collaboration with young girls and women from rural Karnataka, India. We want to thank you for your continued support and encouragement for the growth of Empower Women -Sanitary Solutions. In the summers of 2013, 2014, 2015, and 2016, I had the opportunity to conduct fieldwork and live among Siddis (people of African descent) in Karnataka, India. Much of my time was spent with the village women and young girls who live in rural hostels. Many of these young girls come from families that live in abject poverty. My interviews with them educated me about their concerns surrounding puberty specifically, around menstruation. For example, some castes in India pathologize menstruation to make young women feel as if they have a disease. Further, parents or caregivers feel powerless at helping their children during this process because they themselves are not well equipped with the necessary knowledge about menstruation. The girls and women also disclosed to me that they do not have access to or cannot afford sanitary pads. They resort to using rags from old clothes, newspapers and leaves which put them at a higher risk for bacterial infections. Young girls are absent from school for fifty or more days throughout the school year and women will miss four to five days of farm work per month because of menstrual leakage and the taboos which surround menstruation. Some Non-Government Organizations (NGOs) are working with local Indian government officials to promote reusable sanitary pads, but their availability has not reached Siddi women and girls who remain at a disadvantage because of their minority status as a Scheduled Tribe. Armed with this information, I was motivated to develop a project which enabled the girls and women to gain access to resources which will help them take control of their bodies and reproductive health. The goal of this project is to continue to educate young girls and women about women’s reproductive health, as well as train them to make reusable cotton sanitary pads and market the pads as a sustainable small business enterprise in rural Karnataka, India. For the past four years, I have dedicated my summers to empower young girls and women in rural India on women’s reproductive health issues, specifically on menstruation. Empower Women-Sanitary Solutions provides minority girls and women the opportunity to learn about menstruation and take charge of their bodies. Through your generous support the project has reached over 800 young girls and women. In addition, the project donated sewing machines, created employment, which trained new seamstresses to make cotton reusable sanitary pads, designed focus groups which provides education on women’s health as well as creating a safe platform for the girls and women to share their personal stories — menstruation. The project initially worked with Siddi communities, but has since grown and now reaches more minority young girls and women who also remain at a disadvantage — due to poverty and their social caste status. 1) To empower young girls and women by providing them access to reusable sanitary pads and information relevant to menstruation and female reproductive health. 2) To convene focus groups to identify concerns regarding women’s reproductive health as well as create a network of support for the young girls and women. 3) To teach the women how to sew cotton sanitary pads as a sustainable business enterprise that will generate income for financial stability and provide sewing machines. With your support, the project will continue to spread to more villages, increase the number of participants, train more seamstresses , provide more sewing machines and create access to the reusable sanitary pads. In addition, I will continue to build relationships and work with local community health workers and social workers to strengthen our mission to educate not just young girls and women, but also to educate young boys and men. The funding will be used for educational materials, seamstresses, and for supplies to make the reusable pads, such as cotton fabric, polyurethane laminate fabric (PUL), thread, scissors, sewing machines, hook-and-loop fasteners, snaps, and flannel. Your support makes a difference in empowering the lives of these young girls and women in rural India. Onwards and upwards! Glad to be on this journey with you! Love your cause! wish I could come and be of good service like you ! keep spreading your light in this world, fiona. sending much love. you've inspired me every time you've presented about your project. ❤️ good luck!